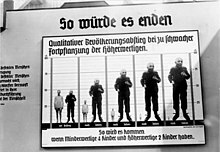 Nazi eugenics were a set of beliefs and rules that were very important to Nazi Germany during World War II. These beliefs said that the Aryan race was the master race – the best race of all – and all other races were inferior (not as good). There were also many other people who the Nazis believed were "life unworthy of life," like people with disabilities. These ideas about eugenics were at the center of the Nazis' beliefs and eventually helped lead to the Holocaust. Because they did not want these "inferior" people in German society, the Nazis decided to get rid of them, using many different strategies. They began with people with disabilities. The Nazis forced more than 400,000 people with disabilities to be sterilized (to have surgery that would make it impossible for them to have children). They also killed over 300,000 people with disabilities in a program called Action T4. In this program, the Nazis sent people with disabilities to places like Hadamar  and Hartheim Euthanasia Centres to be killed. These people were killed with lethal injections and poison gas, in vans and gas chambers at the Euthanasia Centres. Using what they learned by killing people with disabilities, the Nazis soon built extermination camps (death camps). The Nazis' goal was to use these death camps to exterminate (kill all of) the Jewish and Roma people in Europe. The Nazis also sent many other people who they thought were inferior to the death camps and to concentration camps, where they were forced to work as slaves. The eugenics movement was very popular in the United States by the time it spread to Germany. California eugenicists began writing things that encouraged eugenics and sterilization, and sent them to German scientists and medical professionals. By 1933, California had forced more people to get sterilized than all of the other U.S. states combined. The Nazis got the idea for their compulsory (forced) sterilization program partly from California's program. In 1927, The Kaiser Wilhelm Institute for Anthropology (KWIA) was created in Berlin with a lot of financial support from the American philanthropic group, the Rockefeller Foundation. The KWIA's director was Eugen Fischer, a German professor of medicine, anthropology, and eugenics. Fischer said he had found scientific proof of the Nazis' eugenics ideas, and the Nazis used his work to justify their eugenics policies. "You will be interested to know that your work has played a powerful part in shaping the opinions of the group of intellectuals who are behind Hitler in this epoch-making program. Everywhere I sensed that their opinions have been tremendously stimulated by American thought . . . I want you, my dear friend, to carry this thought with you for the rest of your life, that you have really jolted into action a great government of 60 million people." Eugenics researcher Harry H. Laughlin often bragged that his Model Eugenic Sterilization laws had been put into action in Germany's Nuremberg Laws. In 1936, Laughlin was invited to an award ceremony at Heidelberg University in Germany. (The ceremony was scheduled on the anniversary of the day Hitler fired all Jews from the Heidelberg faculty two years earlier.) Laughlin was offered an honorary doctorate for his work on the "science of racial cleansing." Laughlin could not afford to attend, and had to pick his doctorate up from the Rockefeller Institute. Afterwards, he proudly shared the award with his co-workers, remarking that he felt that it showed the "common understanding of German and American scientists of the nature of eugenics." Adolf Hitler read racial hygiene books while he was in Landsberg Prison. "Racial hygiene" was a set of ideas that said that only certain people should be allowed to have children. People who belonged to races that were seen as "inferior" would not be allowed to have children. This way, those races would eventually die out. Hitler believed Germany had become weak, and had been poisoned by "inferior" people. He believed these "inferior" people were ruining Germany's society, and were the cause of Germany's problems. The exposure of the sick, weak, deformed children, in short, their destruction [murder], was more decent and in truth a thousand times more humane than the wretched insanity of our day [in which the most disabled people are allowed to survive], and indeed at any price ... in order subsequently to breed a race of degenerates burdened with illnesses. Basically, Hitler was saying it was better (and cheaper) to kill people with disabilities than to allow them to live and have children. He thought that if people with disabilities were allowed to have children, their children would also have disabilities. So people with disabilities should be killed to prevent them from "breeding [creating] a race of" "inferior" people. Hitler would later apply these same ideas to other people he thought were "inferior." The Holocaust was based on the idea that all of these "inferior" people should be killed so they would no longer exist in the Third Reich, Hitler's planned Nazi empire. In organizing their eugenics program, the Nazis were inspired by the United States' programs of forced sterilization, and especially the eugenics laws that had been enacted in California. It required everyone with a genetic disorder to be sterilized. It required doctors to report any patient with a genetic disorder to the Nazis (except in women over age 45). It created fines to punish doctors who did not cooperate with the law. In 1934, nearly 4,000 people appealed against court decisions saying they would have to be sterilized. A total of 3,559 of the appeals (89%) failed. By the end of the Nazi regime, the Nazis had created over 200 Hereditary Health Courts (Erbgesundheitsgerichte). Based on their rulings, over 400,000 people were forced to be sterilized. The Nazis made six psychiatric hospitals into "Euthanasia Centres," where people with disabilities (including children) were taken to be killed. These six hospitals were Bernburg, Brandenburg, Grafeneck, Hadamar, Hartheim, and Sonnenstein Euthanasia Centres. At first, the Nazis killed patients in gas vans. The patients would be put into vansand exhaust gas from the vans' engines would be pumped into the vans. The carbon monoxide in the exhaust gas killed the patients. Later, gas chambers were built into the Euthanasia Centres and used pure carbon monoxide gas to kill the patients. In July 1934, Nazi Germany passed the Law for Simplification of the Health System. This law set out rules for how the Nazis would decide whether a person was 'genetically sick.' The person would be sent to a Genetic Health Court, which would decide whether the person should be sterilized. The Nuremberg Laws of 1935 made anyone who wanted to get married get tested for genetic disorders. The goal of this rule was to make sure the "Aryan race" would stay "pure," without people with disabilities in it. While dating, everyone was encouraged to question their dating partner carefully about whether anyone in their family ever had a genetic disorder. Members of the Schutzstaffel (SS) were ordered to carefully interview possible marriage partners to make sure they had no family history of hereditary disease or insanity, but to do this carefully to avoid hurting the woman's feelings. They were told that if they had to reject the woman for eugenic reasons, they should do it politely and not upset the woman. ↑ Peter Longerich (15 April 2010). Holocaust: The Nazi Persecution and Murder of the Jews. Oxford University Press. p. 30. ISBN 978-0-19-280436-5. ↑ 2.0 2.1 2.2 2.3 2.4 Lifton, M.D., Robert Jay (1986). The Nazi Doctors: Medical Killing and the Psychology of Genocide. New York: Basic Books. ISBN 0-465-04904-4. ↑ 3.0 3.1 3.2 "Close-up of Richard Jenne, the last child killed by the head nurse at the Kaufbeuren-Irsee euthanasia facility". United States Holocaust Memorial Museum. Retrieved July 29, 2011. ↑ Sharon L. Snyder and David T. Mitchell (May 15, 2006). Cultural Locations of Disability. University of Chicago Press. ISBN 978-0226767321. ↑ 6.0 6.1 6.2 Friedlander, Henry (1995). The Origins of Nazi Genocide: From Euthanasia to the Final Solution. University of North Carolina Press. ISBN 0-8078-2208-6. ↑ 7.0 7.1 Suzanne E. Evans. Forgotten crimes: the Holocaust and people with disabilities. p. 93. ISBN 1566635659. ↑ Schafft, Gretchen E. (2004). From Racism to Genocide: Anthropology in the Third Reich. Chicago: University of Illinois Press. p. 48-54. ISBN 978-0252074530. ↑ Wistrich, Robert S. (November 7, 2001). Who’s Who in Nazi Germany. Routledge. p. 60. ISBN 978-0415260381. ↑ Lombardo, Paul A. (2008). Three Generations, No Imbeciles: Eugenics, the Supreme Court, and "Buck v. Bell". JHU Press. pp. 211–213. ISBN 9780801890109. ↑ Friedman, Jonathan C. (2011). The Routledge History of the Holocaust. Taylor & Francis. p. 49. ISBN 978-0-415-77956-2. Retrieved 1 August 2011. ↑ Evans, Richard J. (2005). The Third Reich in Power. Penguin Press. p. 429. ISBN 978-1-59420-074-8. Retrieved 1 August 2011. ↑ Hitler may have been using ideas borrowed from Ernst Haeckel. In 1876, Haeckel had written about Sparta's selective infanticide policy in Haeckel, Ernst (1876). "The History of Creation, vol. I". New York: D. Appleton. p. 170. Among the Spartans all newly born children were subject to a careful examination or selection. All those that were weak, sickly, or affected with any bodily infirmity, were killed. Only the perfectly healthy and strong children were allowed to live, and they alone afterwards propagated the race. ↑ Hitler, Adolf (1961). Hitler's Secret Book. New York: Grove Press. pp. 17–18. ISBN 0-394-62003-8. OCLC 9830111. ↑ Hawkins, Mike (1997). Social Darwinism in European and American Thought, 1860-1945: nature as model and nature as threat. Cambridge University Press. p. 276. ISBN 0-521-57434-X. OCLC 34705047. ↑ The Law for the Prevention of Hereditarily Diseased Offspring. (Official translation into English of the "Gesetz zur Verhütung erbkranken Nachwuchses"). Enacted on July 14th, 1933. Published by Reichsausschuss für Volksgesundheitsdienst. (Berlin: Reichsdruckerei, 1935). ↑ Fuller Torrey, Edwin; Yolken, Robert (January 2010). "Psychiatric genocide: Nazi attempts to eradicate schizophrenia". Schizophrenia Bulletin 36 (1): 26–32. doi:10.1093/schbul/sbp097. PMC 2800142. PMID 19759092. https://www.ncbi.nlm.nih.gov/pmc/articles/PMC2800142. Retrieved 28 March 2012. ↑ Padfield, Peter (1990). Himmler: A Full-Scale Biography of One of Hitler’s Most Ruthless Executioners. MJF Books. ISBN 978-1567311181. This page was last changed on 10 October 2018, at 06:09.